FRANKFURT, Germany– In what was a thrilling but devastating loss to the Japan Women’s National Soccer team on July 17th, the United States National Women’s team unfortunately left the World Cup without the gold medal. A “first runner up” finish was not what players Christie Rampone and Abby Wambach had hoped for. Wambach, specifically, may never have another chance to win a World Cup tournament. At 31, she will most likely age out of her prime before the next tournament takes place. Still, the women’s team has their heads held high in preparation for their next tournament. “[The Olympics] has to be our next target,” said Wambach. The 2012 Summer Olympics, held in London England, will be the next time these incredible athletes will have a chance to take home a first place prize. The US team lost its World Cup final game in true competitive fashion, by a penalty kick from Homare Sawa. A 2:2 tie had led to a shootout between the two teams. 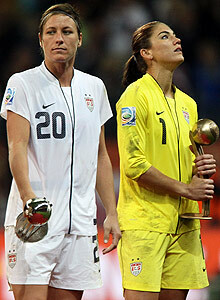 After the loss, USA goalkeeper Hope Solo and striker Abby Wambach received individual awards for their star performances. “It’s a bittersweet feeling,” said Solo referring to the loss paired with her award. We at Bold Magazine have said this throughout the tournament, however, that the real winners here are female athletes. All across the US, bars and living rooms were overflowing with soccer and sports fans alike, cheering for the US team. Facebook and Twitter were bursting with updates and trending topics such as #WomensWorldCup, #WorldCupFinals, #WWC2011, Alex Morgan, Abby Wambach, Hope Solo, etc. Nationalism was at an all-time high. And, it was all because of these athletes. So, thank you US Women’s National Soccer Team, just for being you…and for being BOLD! Finally, US Women’s National Soccer Team in the Spotlight!